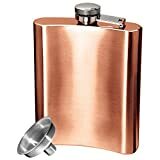 Need a beverage (possibly inebriating) on the go? 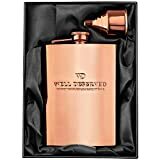 Grab this Copper Flask handcrafted by the fine coppersmiths at Jacob Bromwell, a Cincinnati kitchenware manufacturer since 1819. 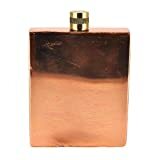 Using the same design they used back then - before the Civil War and when the Oregon Trail was just becoming popular - this flask is hand formed, hand soldered, and topped with a birch stopper. 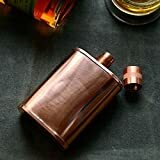 After use, the copper will naturally oxidize, giving the flask even more character with a rich patina. 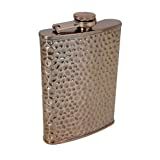 Of course, you can always polish the flask if you want to restore it to a sleek, shiny finish. Measures: 3" L x 1.5" W x 5.5" H - 9 oz.